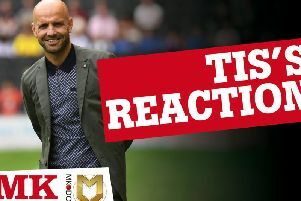 Match-winner Russell Martin admitted his goal felt like it was in slow motion as he netted with four minutes to go to send MK Dons second in League 2. The 33-year-old, who joined the club in January, got on the end of Jake Hesketh's 86th minute cross to fire past Lewis Ward to fire home his first for Dons in the 2-1 victory at The New Lawn. "I used to be good for a goal but they've dried up recently!" Martin said afterwards. "It's a great feeling, and I think we deserved it on the whole. We created a lot of openings, we just weren't as clinical in the final third. We were solid, they had limited chances, we disrupted the way they play and all in all, it's a good day. When they scored, it takes a lot to bounce back from that. Momentum had swung but the subs were brilliant. "And it shows the desire when Joe Walsh keeps the ball in, Jake Hesketh has a bit of quality to find me at the back post and it felt like it took forever to go in, to be honest! It was the slowest goal ever! But we're massively relieved. "I think we were fairly comfortable defensively, we limited them to half chances. We've been solid recently, but teams are always going to have chances. If you look at the top end of the pitch, the way Kieran works, it all starts at the front with his pressing. David Wheeler has put in a shift today and we'll need that until the end of the season." With Bury slipping up against Swindon, Dons took over in second with six games remaining. Martin continued: "It feels like a big win, whenever you score late against a team and win against a team who is close to us, it's a good three points. "I'd be lying if I said we did not look but the focus is on ourselves. You have a look at what has happened, it's human nature, but we we can only play our games. All the games in the run-in are as big as the rest."